Part 1 Advances in wool fibre and fabric production: Improvement of wool quality through genetic engineering; The objective measurement of wool fibre quality; Wool as a natural renewable fibre; Advances in wool spinning technology; Advances in wool weaving and knitting; Advances in the manufacture of nonwoven wool; Wool finishing and the development of novel finishes; The coloration of wool. Part 2 New wool products and applications: Improving the whiteness and photostability of wool; Enhancing wool products using nanotechnology; Wool performance apparel for sport; High-performance wool blends; Intelligent wool apparel; Application of wool keratins ranging from industrial materials to medical devices. Advanced research into wool science and technology is leading to a better understanding of the properties of wool. Wool is increasingly being seen as a high performance fibre, with new modifications and applications. 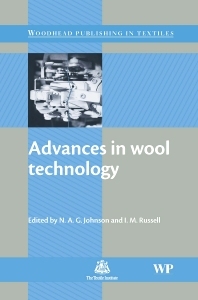 Advances in wool technology presents a comprehensive account of these developments and innovations. Part one includes advances that have occurred in the production and processing of wool. Topics range from the progress in wool spinning, weaving and colouration, to environmental supply chain management and to the role of genetic engineering in improved wool production. Part two reviews new wool products and applications. Chapters include the production of brighter and whiter wool, high performance wool blends and wool for apparel. With its two distinguished editors and array of international contributors, this book is a valuable reference for producers, manufacturers, retailers and all those wishing to improve and understand developments in wool technology. It will also be suitable for researchers in industry or academia. Dr Nigel Johnson is Chief of the Division of Textile and Fibre Technology, at CSIRO, Australia. CSIRO is one of the world’s leading research centres in fibre structure. Dr Johnson joined CSIRO in 2005 after a distinguished career with Canesis Network in New Zealand as Deputy CEO and General Manager of the Textiles Division. Dr Ian Russell is Manager of the Environmental Analysis Group at CSIRO. As an organic chemist, Dr Russell has led numerous projects on wool technology, ranging from wrinkle prevention to sustainability.